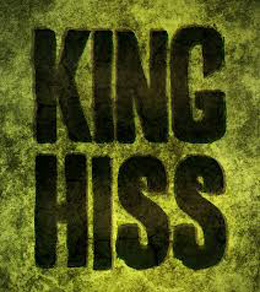 King Hiss is a musical collaboration between Jan Coudron (Carneia, Fenndango), Jason Bernard (Gootch), Visioene (Mans Ruin, Empathy) and Josh Fury (Mans Ruin, Congress, Liar) witch happened somewhere in june 2011. These rockers try to find the perfect balance between heavy riffing, sticky choruses and groovy rythms. but the ball started rolling when the band started taking shape after Jason and Josh's bands fell apart. Dominiek joined on bass and while at first Josh was doing the vocals, Jan took interest and was recruited to join the band. When you listen closely, you can hear that the band took inspiration from bands such as Danko Jones and Red Fang. but i beg to differ, they sound harder and even here and there you can find a pinch of Mastodon influences. It's a great demo, no doubt about it but it’s also unfortunate that it is just a demo so it is a bit more difficult to judge only three songs. But fair is fair and the songs that are there are great.